Given how much I enjoyed [b:The Liar Society|9182417|The Liar Society (The Liar Society, #1)|Lisa Roecker|https://d202m5krfqbpi5.cloudfront.net/books/1348517952s/9182417.jpg|7374349], I was really excited to read the sequel. Unfortunately, although The Lies That Bind kept me guessing throughout the entire book, I just didn't enjoy it as much as the first one. The Lies That Bind picks up directly after the events in The Liar Society. Kate has discovered that a conflict between two of the school's powerful societies, the Sisterhood and the Brotherhood, was responsible for her friend Grace's death, and now another member of the Sisterhood has gone missing. The mystery surrounding the girl's disappearance was well-executed, and complete with enough disturbing texts and twists to keep you guessing at who was to blame. While I was curious about the mystery, it just wasn't as engaging as the mystery in The Liar Society. I think a large part of this is because Kate has no emotional attachment to the case that she's trying to solve; instead, she's motivated by revenge and anger, making it more difficult for me to get emotionally invested in the story's outcome. Kate was still full of snark and sarcasm, and her interactions with her neighbour Seth led to some lighter, humorous moments throughout the story. Speaking of whom, I love Seth. His obsession with UFOs and other mysterious phenomena is surprisingly endearing, and his willingness to help Kate without question is certainly admirable. Everyone needs a friend who is as devoted and caring as he is. My main issue with The Lies That Bind was Kate and Liam's relationship problems. One one hand, I understood why they were there - Kate did need a voice of reason to suggest that maybe she was becoming a bit too obsessed with revenge - but I found myself caring a lot more about the secret societies, creepy messages, and hidden passageways than their relationship. It just seemed to distract from the real issues at play, which was kind of disappointing. 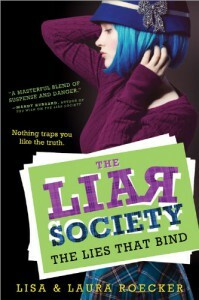 Overall, I didn't enjoy The Lies That Bind as much as the first book in the series. Hopefully the final book will keep me more engaged.